This workshop goes beyond the theoretical background for ERP and focuses on the actual practice. All of the anxiety disorders will be reviewed and case studies will be explored showing the ins and outs of using Cognitive Behavioural Therapy and ERP in an intensive format. Designed to be used in weekly sessions, the techniques discussed will showcase how and why to use ERP to get best results with your patients. 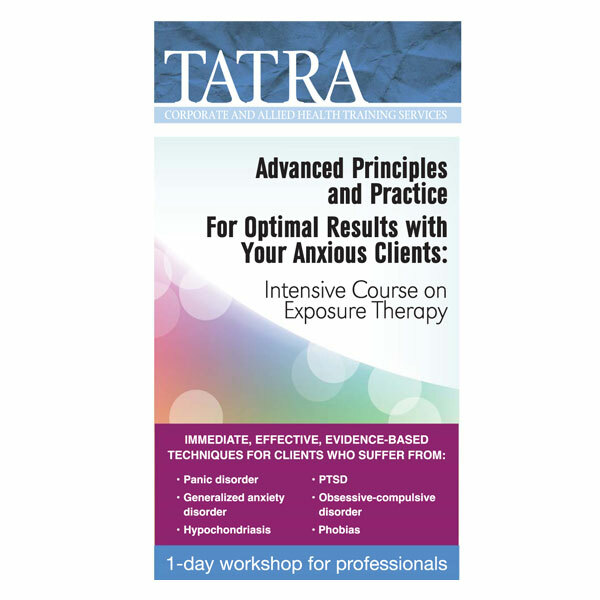 The Exposure and Response Prevention (ERP) approach to the treatment of anxiety disorders is seen as the most effective treatment available for anxiety disorders yet it is an approach used by some practitioners only. The theory behind ERP for the treatment of anxiety disorders is sound, well supported, and validated. Therefore, our anxious clients suffer needlessly while less adequate treatments or only medical approaches are applied to their care. Dr.’s Deacon and McGrath have been featured on television, radio, in journals and books, and have spoken internationally on the subjects of anxiety and ERP. They both authored specialist books on the topic, and are both on advisory boards including the Association for Behavioural and Cognitive Therapies, the International Obsessive Compulsive Disorders Foundation, and the Anxiety and Depression Association of America. Currently, they are collaborating on research to see exactly why it is that therapists have difficulties using ERP, as well as how clients perceive ERP as it is applied to their specific case.